Crossing at the Straits of Tiran in the Gulf of Aqaba. We only know with certainty, three of the nearly 50 places listed in the exodus between Egypt and the Jordan 40 years later. Rameses (Goshen), Ezion-Geber (modern Elat) and Mt. Nemo. God has chosen for us to know only the starting, midway and ending cities. Nothing in between is known for certain. Additionally, of all the wilderness areas mentioned in the exodus, we only know for certain that the Wilderness of Shur was in Midian where Ishmael settled. We do not know for certain any of the following places: Mt. Sinai, Wilderness of Sinai, Kadesh Barnea, Wilderness of Zin, Wilderness of Paran. All these places are interdependent on each other. The fact that there are over 15 different proposed sites for Mt. Sinai on three different continents proves this. In trying to locate the crossing point of the Red Sea, we need to follow closely what the Bible says. Of course the actual crossing point needs to be possible, logical and harmonize with scripture. For example, crossing a shallow freshwater lake like the Bitter Lakes, where winds merely blew the water away, creates a problem for how the Egyptian army would be drowned. On the other hand, a crossing through the center of either the Gulf of Suez or Gulf of Aqaba where the water is often 1800 meters deep, easily explains the drowning of the army, but creates a problem in actually getting one million men, women, children and livestock to negotiate the steep 60 degree downward slope to the bottom almost a mile deep, then back up the other equally steep side. The date of the exodus was 1446 BC, in the 18th dynasty of Egypt, 480 years before Solomon built the Temple: 1 Kings 6:1. About 70 years later, Pharaoh Akhenaten (1379 - 1362 BC) would arise and promote a monotheism that worshipped the sun god Aten. All things considered, we are proposing that the Straits of Tiran in the Gulf of Aqaba, is the best candidate crossing point in 1446 BC. In addition to directly contradicting the Bible, all northern crossing points like "Lake Sirbonis" must be wrong because like the Bitter Lakes, they provided no absolute security and protection from Egypt. B. The Bible says the Red Sea is the Gulf of Aqaba. The gulf of Aqaba is called the Red Sea and is what the average Hebrew thought of when referring to the Red Sea: Ex 23:31; Num 21:4; Deut 2:1; Judges 11:16; 1 Kings 9:26. The gulf of Suez is called the Red Sea only once: Ex 10:19. No freshwater body of water is ever called the Red Sea in the Bible including the Bitter Lakes and Lake Timsah. These two lakes are suggested as possible traditional "Red Sea" crossing points. Bitter Lakes and Lake Timsah are never called the Sea of Reeds but they are shallow lakes with reeds in them. But this is true of all shallow freshwater bodies in the region. The correct name therefore is "Red Sea". Let us forever cease from calling it "The Sea of Reeds". C. Deep enough to create a wall of water: Type of Baptism. All of this was miracle. The wind both helped divide the waters, but more likely were the agent that dried the seabed. Then there was the miraculous wall of water on both sides. Skeptics looking for naturalistic and non-miraculous explanations, like to think of a shallow lake a few feet deep (like the Bitter Lakes), being swept back by a typical strong wind. But they cannot explain the wall of water. In fact they dismiss the wall of water, saying the word in Hebrew just means a brim, a wave. In fact the word "wall" is used over 140 times in the Old Testament and it is the common word used countless times for city walls. Bulrushes and reeds grow in very shallow lakes. The Bible says that their was a wall of water on both sides of the sea when they crossed, indicating a great depth that would not allow reeds to grow. "Sea of Reeds" is the name the modernists prefer so they can explain away the great miracle of the parting of the Red Sea. They explain that it was a shallow fresh water lake of bullrushes and God simply blew away 10 feet of water to allow them to cross. Of course their real intent is to find a non-miraculous explanation for the story and this is why they prefer to call the Red Sea, the Sea of Reeds. This is where any suggested crossing point like the Bitter Lakes or the northern Suez becomes plain silly because they are just too close to Egypt to say this. They are clearly NOT IN THE WILDERNESS, since the Bitter lakes are about 25 miles from the edge of Goshen where they lived. The Northern Suez crossing is only 60 miles. Far too close to worry about dying in the wilderness if it was just a days walk back to your old bed in Goshen. Why they would probably walk to the Bitter Lakes to fish on their day off just for fun. But if you are 240 miles away from your bed, in a desolate area far from civilization, then the complaints about dying in the wilderness at the hands of Pharaoh's army are quite justified. Also, the Bitter Lakes are fresh drinkable water. With their herds, they had no concerns of starving or dying of thirst. So being 30 miles from their beds, with ample food supply, beside a major fresh water lake, no one would call this "in the wilderness". Israel rejoiced after crossing the Red Sea. They did not fear the Egyptian army any more. Three suggested crossing points must be wrong because they provided absolutely no security: 1. Bitter Lakes. 2. Lake Timsah. 3. Northern tip of Gulf of Suez.. At these crossing points, the pillar of fire could not protect Israel, since Pharaoh's army would simply go around the lake from both sides and ambush them! Even with Pharaoh's army drowning, these crossing points are so close to Egypt, that a second army, though inferior to the first, would be sent by Pharaoh. The second army would attack Israel from all directions. Therefore, these crossing provide no peace of mind at all. If I had just crossed a small lake that was 5 miles through the middle and 10 miles around the shores, I would not be singing the song of Moses, I would keep running away! But when they crossed at the Gulf of Aqaba, they knew they were fully secure right there and then with no "what ifs", second thoughts or worries. Therefore, the only crossing point of all our choices that would provide absolute security and peace of mind is the "Straits of Tiran" at the Gulf of Aqaba. F. Don't ignore the wilderness of Egypt before they crossed the Red Sea. 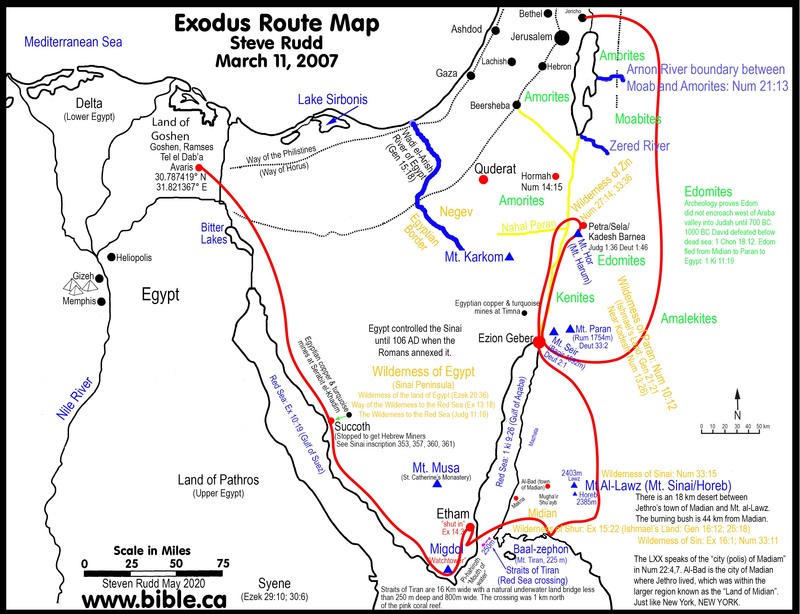 The Bible sequence for the exodus route says they traveled in the wilderness of Egypt to get to the Red Sea. The correct sequential order is "wilderness before the Red Sea" crossing. (Exodus 13:18; Judges 11:16). "Hence God led the people around by the way of the wilderness to the Red Sea; and the sons of Israel went up in martial array from the land of Egypt. " Exodus 13:18 "For when they came up from Egypt, and Israel went through the wilderness to the Red Sea and came to Kadesh, " Judges 11:16. Only a crossing at the Gulf of Aqaba has a wilderness wandering before they crossed the Red Sea. Those who believe Israel crossed at the north tip of the Gulf of Suez fail to harmonize the sequence of "Wilderness travel before Red Sea". They trace the route due south from Goshen towards the western side of the Gulf of Suez, then cross over into what is traditionally called the Sinai peninsula where they travel in the wilderness to the traditional Mt. Sinia at Jebel Musa (St. Catherine's Monastery). Some "north Gulf of Suez crossing advocates attempt to harmonize the "Wilderness before the Red Sea crossing" sequence by tracing the route as follows: From Goshen east of either the Bitter lakes, "into the wilderness" then south for 20 miles, then west (back out of the wilderness) towards the Nile over top of the Gulf of Suez, then south again for about 5 miles to the west side of the Gulf of Suez where they crosses the "Red Sea" from west to east back into the "Wilderness of Sinai" a second time. This is just too bizarre a route to be correct. A better choice is a crossing at the Gulf of Aqaba. Most people completely overlook this clear detail that Israel traveled through a wilderness to get to the Red Sea. Once they crossed the Red Sea, they entered into the Wilderness of Shur. Only the Gulf of Aqaba crossing at the Straits of Tiran agrees with the sequence of events in the Bible: 1. They left the populated areas of Egypt. 2. traveled a considerable distance in the wilderness. 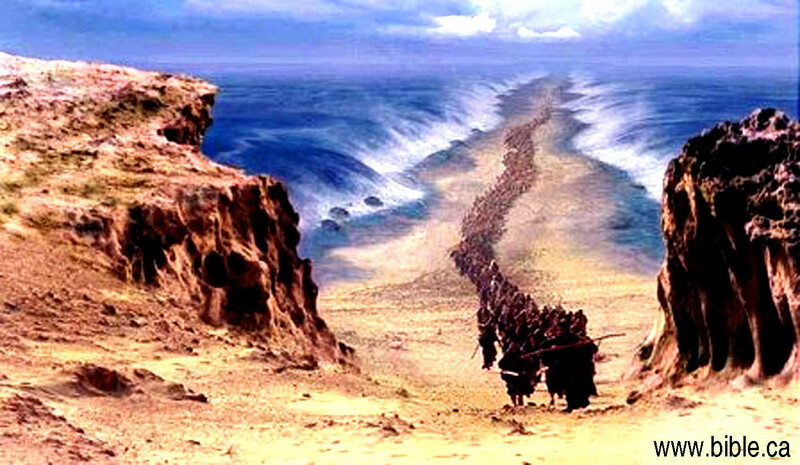 3. which led to the Red sea where they crossed. The Bible says they traveled in the wilderness to get to the Red sea. The traditional crossing points have it opposite: They crossed the Red Sea then afterwards, entered the wilderness. This is backwards and proves a Gulf of Aqaba crossing point. G. Etham and Red Sea were the "distant edge" of the wilderness. Immediately before the crossing of the Red Sea is "Etham, which is on the edge of the wilderness." Numbers 33:6. Traditional thinking interprets this as the starting edge of the wilderness on the west side of the Bitter Lakes before they entered what is traditionally called the Sinai Peninsula. When you cross a wilderness there are always "two edges". The near edge at the start of the wilderness crossing and the far edge as you leave the wilderness. H. They arrived at the Red Sea after traveling through the wilderness and were then at the "distant edge" of the wilderness. Now lets imagine they travel from Goshen to the Bitter lakes or the North Suez. If the 10 mile area between the outskirts of Goshen and the Bitter Lakes are considered a wilderness, then the edge of the wilderness, in traditional thinking, would be at the outskirts of Goshen where they began. But the edge of the wilderness was immediately before they crossed. You cannot travel through a wilderness, then be at the starting edge of the same wilderness at the same time. Remember there is only one wilderness in focus here. Clearly this is a general summary verse that traces the whole trip: "For when they came up from Egypt, and Israel went through the wilderness to the Red Sea and came to Kadesh, " Judges 11:16. It just so happens that the distance from Egypt they went through the wilderness to the Gulf of Aqaba (Red Sea) is roughly about the same distance of 220 Miles. After they crossed, they were only 30 miles from Mt. Sinai (Jebel al-Lawz). The crossing therefore was the approximate halfway mark of the journey to Kadish Barnea (just south of Petra) where they spent 30 years (many days) living before entering the promised land. That is what the verse is conveying. The traditional and most popular route is a red sea crossing at the Bitter Lakes, through the wilderness to Jebel Musa in what is traditionally called the Sinai Peninsula, then to Kadesh Barnea at Ein el Qudeirat. But the traditional route from Egypt to the Bitter Lakes to Kadesh are dramatically unequal in every regard. The first leg was 30 miles from Goshen to the Bitter Lakes (Red Sea) and the second leg was a wopping 350 miles to Kadish Barnea. (Ein el Qudeirat). Even if they got the location of Kadish Barnea correct just south of Petra, the second let is still 300 Miles. For the traditional thinkers, if Israel crossed at the Bitter Lakes, then Judges 11:16 would read differently than it does. For them, Judges 11:16 should read: "they came up from Egypt came to Mt. Sinai (220 miles), then from Mt. Sinai to Kadesh Barnea (190 miles)." These are similar distances. J. What does the Bible call that "V" shaped area of land between the Gulfs of Suez Aqaba? "Wilderness of Egypt" you say? All modern maps are wrong in regard to the "Sinai Peninsula". One glaring error is calling "V" shaped area of land between the Gulf of Suez and the Gulf of Aqaba the Sinai Peninsula. Mt. Sinai must be in the Sinai Peninsula, Right? Wrong. The error is circular reasoning. Because Queen Helina chose Jebel Musa in 325 AD, (St. Catherine's Monastery) as Mt. Sinai, all maps since have called it the wilderness of Sinai or the Sinai Peninsula. But if Mt. Sinai is really at Mt. Karkom, located about 30 miles north west of Ezion-geber. (modern Elat), then this changes everything! And if Mt. Sinai is really Jebel al-Lawz in modern North Saudi Arabia, this really changes everything! The Bible no where identifies the wilderness of Sinai as being geographically tagged to the V shaped area of land between the Gulf of Suez and the Gulf of Aqaba. All we know is that Mt. Sinai/Horeb is in the wilderness of Sinai. Find one and you have found the other! But the Bible doesn't specifically tell us where the wilderness of Sinai is located. If it did, we would not have 10 different candidate locations for Mt. Sinai hundreds of miles apart! The Bible does tell us that Mt. Sinai is in the wilderness of Shur. And Shur is where the Ishmaelites lived. And we know the Ishmaelites lived directly with the Midianites. In fact they are used interchangeably in the story of Joseph being sold into Egypt. So we know Mt. Sinai must be in the land of Midian. Although the Bible never directly tells us where the Wilderness of Sinai is, the Bible does give four different names for geographic V shaped area of land between the Gulf of Suez and the Gulf of Aqaba that has traditionally been called the Sinai Peninsula. Here they are: 1. "the way of the wilderness to the Red Sea" (Exodus 13:18) 2. "the wilderness to the Red Sea" (Judges 11:16). 3. "the wilderness of the sea" (Isa 21:1) 4. "wilderness of the land of Egypt" (Ezekiel 20:36) If you study these four passages carefully, you can see that this is clearly the case. We feel perfectly justified in calling it the "The Egyptian Red Sea Wilderness", based strictly upon what the Bible calls this region. In Isa 21:1 Babylon is likened unto the geographic region west of the Negev (traditionally called the Sinai peninsula) and called "the wilderness of the sea". "The oracle concerning the wilderness of the sea. As windstorms in the Negev sweep on, It comes from the wilderness, from a terrifying land. " Isaiah 21:1. Here the "the wilderness of the [Red] sea" does not refer to the geographic land of Babylon. Instead, it is saying that Babylon will destroy Judah, like the wind that blows into the Negev from "the wilderness of the sea". The heavy and damaging winds always blow from west to east, so the Bible calls the modern Sinai Peninsula "the wilderness of the sea". The Israelites were all too familiar with the strong and destructive winds that blew from this area into the Negev. Isa 21:1 is warning that destruction for Judah will originate with Babylon in the same way that the strong winds originate from the "the wilderness of the Red sea". The "the wilderness of the Red sea" is a metaphor for Babylon, but not exactly the same as Babylon. Notice the Hebrew parallelism that seems to indicate that the Red sea was seen as adjacent to the territory of Egypt: The Red Sea is in the land of Ham: "Wonders in the land of Ham And awesome things by the Red Sea. " The Bible tells us that Ham lived in Egypt and archeology tells us he lived on both sides of the Gulf of Suez. Psalm 106:22 "And smote all the firstborn in Egypt, The first issue of their virility in the tents of Ham. " Psalm 78:51 "Israel also came into Egypt; Thus Jacob sojourned in the land of Ham. (Before exodus)" Psalm 105:23. We admit the Hebrew parallelism of Ps 106:22 is weak because it also works for a crossing at the Bitter Lakes. It also could be viewed as not being a Hebrew parallelism: "Wonders in the land of Ham (ten plagues) and awesome things by the Red Sea (parting the water). But if the crossing is the Staits of Tiran, it works too! K. The Egyptian-Israeli border is the "River of Egypt". The formal western boundary of Israel is the River of Egypt (Wadi al-Arish). Cross the River of Egypt and you are in Egypt! That's why its called The River of Egypt! Abraham went directly from Egypt to the Negev without passing through any other territory. "So Abram went up from Egypt to the Negev, he and his wife and all that belonged to him, and Lot with him. " Genesis 13:1. This verse is exactly what we would expect if the River of Egypt (Wadi al-Arish) is the boundary line between the Negev and Egypt. Notably, when people cross the River of Egypt the Bible never puts any land, region or area between the two. 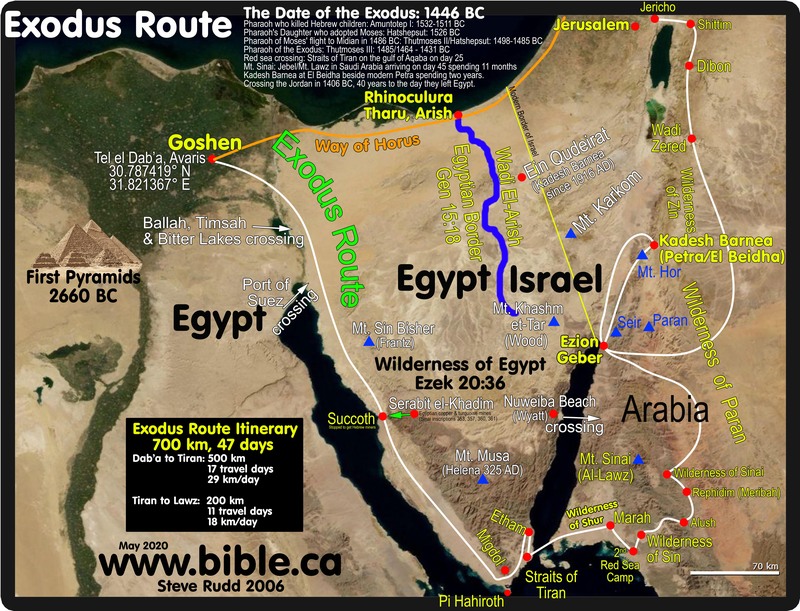 If the border of Egypt really was at the edge of the land of Goshen by the Bitter Lakes, we would expect the Bible to say things like, "An Abraham left the Negev and travelled in the wilderness, then came to Egypt. We never find a single Bible verse that indicates a land between Egypt and Israel, because the River of Egypt is the eastern boundary of Egypt! Premillenialists discount the Bible verses that say Israel got all the promised land: "So the Lord gave Israel all the land which He had sworn to give to their fathers, and they possessed it and lived in it. " Joshua 21:43. They argue that the River of Egypt is not the Wadi al-Arish, but the Nile River. Of course this won't work because the Nile is a much greater river than the Euphrates and of course it would mean that they were already in the promised land in Goshen before the exodus started! So the western boundary of Israel is the River of Egypt, which is the Wadi al-Arish. Most Bible map sets have this correct. The power of name of this river that the sets the boundary between Egypt and Israel was understood in the mind of every Jew. What country other than Egypt controlled this region? Was it just a blob of vacant wasteland no country laid claim to? The fact remains that from 1500BC up to the completion of the New Testament, the land west of the River of Egypt was considered part of Egypt. Sure Egypt proper was west of the Nile, but this area was an Egyption protectorate. The Romans annexed what we call the "modern Sinai Peninsula" in 106 AD. Prior to this, it was considered the territory of Egypt. Because of mining operations, it was an Egyptian protectorate under the military control of Egypt. This means that Egyptian territory butted up to the western boundery of Israel (Wadi al-Arish in the Negev). After 106 AD, the "modern Sinai Peninsula" became accociated with Arabia. This understanding also proves that Mt. Sinia cannot be in this region at Jebel Musa, since Paul said Mt. Sinai was in Arabia. (Gal 4:25) Since Arabia was restricted to Saudia Arabia and south east of the Dead Sea, until 106 AD, Jebel al-Lawz becomes a primary candiate for Mt. Sinai. Remember Queen Helina chose a lot of places in 325AD on the basis of feelings and superstition that were clearly not historically correct. These include the Birth place of Christ's birth (Bethlehem) and Jebel Musa for Mt. Sinai. Ezekiel calls the "modern Sinai Peninsula" the "wilderness of the land of Egypt". Ezek 20:36 "As I entered into judgment with your fathers in the wilderness of the land of Egypt, so I will enter into judgment with you," declares the Lord God." Ezekiel 20:36. Just where did God judge Israel in "the wilderness of Egypt"? The first recorded faithless grumbling is Israel was while they were still in Egypt against Moses who was trying to get them to leave in the first place. Ezekiel makes reference to the second recorded faithless grumbling of Israel in the wilderness of the land of Egypt just before crossing the Red Sea: "Then they said to Moses, "Is it because there were no graves in Egypt that you have taken us away to die in the wilderness? Why have you dealt with us in this way, bringing us out of Egypt? "Is this not the word that we spoke to you in Egypt, saying, 'Leave us alone that we may serve the Egyptians'? For it would have been better for us to serve the Egyptians than to die in the wilderness."" Exodus 14:11-12. Although God did not kill them until their next faithless grumbling on the other side of the Red Sea, Ezekiel tells us that God had Judged them for their faithlessness. They were marked for punishment. The Ishmaelites and the Midianites lived together in the land of Midian and are referred to interchangeably in the Bible. But the Bible also says that "Ishmael settled from Havilah to Shur which is east of Egypt as one goes toward Assyria; he settled in defiance of all his relatives." Genesis 25:18 Haviliah was south east of the dead sea and Shur was in the land of Midian (modern Saudi Arabia). There was a highway running north to south between Haviliah and Shur where Ishmael lived. Another reference to this highway is: "So Saul defeated the Amalekites, from Havilah as you go to Shur, which is east of Egypt. " 1 Samuel 15:7. Now that we know the highway ran north and south but east of Araba Valley which would drain the dead sea into the Red sea if the water still flowed. Here is the point: This area is described as being, "east of Egypt" which only makes sense if the "Traditional Sinai Peninsula" is considered part of Egypt. If we let the Bible guide us first, then look at the geography of the Gulf of Aqaba, we will see that the Straits of Tiran are the best candidate for the Red Sea crossing. Scripture says that Israel went past the Red Sea crossing point to Pi-hahiroth, then turned back again. "For Pharaoh will say of the sons of Israel, 'They are wandering aimlessly in the land; the wilderness has shut them in.'" Exodus 14:3. The Straits of Tiran are clearly where this happened! Pharaoh, knowing the geography of the area understood that Israel had reached the dead end of this plain and was literally boxed in by high mountains and the Red Sea. Pharaoh's best army came roaring up behind them leaving them only two choices: climb or swim. Praise God for miracles! As Israel departed Goshen, they traveled 275 miles to reach the Straits of Tiran. There is a wide coastal plain on the eastern side of the Gulf of Suez that butts up against a high mountain range and also follows the coastline around to the Straits of Tiran. So as they walked south for the entire trip beside the Gulf of Suez, they were boxed in on the east by the mountains and on the west by the Gulf of Suez. But this continuous coastal plain provided the perfect highway for a million people. When they got to Pi-hahiroth, they turned back again to the Straits of Tiran because they hit a dead end: A mountain range. Pharaoh knew Israel must trace their steps back the way they came and figured it would an easy slaughter, since Israel was trapped. So for a military leader the route they traveled was a disaster, but Israel's military leader could part the red sea. There is no absolute "boxing in" at any other crossing point like the Bitter Lakes or the north Gulf of Suez. The Gulf of Aqaba is a very deep channel of water ranging from 800-1800 meters in the middle. However at the Straits of Tiran, there is a natural land bridge so the deepest point the Israelites would encounter is only 205 meters. The crossing at the Straits of Tiran is 18 km long and a natural land bridge provides for an 800 meters wide pathway the full distance of the crossing. The Straits of Titan have a shallow coral reef in the middle with a one way shipping lane on either side. From modern nautical charts, we can see that the eastern "Enterprise Passage" is 205 meters deep and 800 meters wide and the western "Grafton Passage" is only 70 meters deep and 800 meters wide. A diver need go only 13 meters at deepest point on top of Jackson's Reef from the surface. Coral growth over the last 3500 years since the miraculous crossing means that we cannot really know what the sea floor looked like exactly back then. For example, as the coral grew up and came to the surface, the tides flowing around the coral would dig a natural channel deeper on the north and south ends of the reef where all the water would flow around. Gradually, the coral reefs would act like a partial dam over the center 80% of the strait. This is a very realistic scenario and means that 3500 years ago, the coral was under water and therefore the tides would not dig the deep channel at either end of the reef where it is today. But even with the depths we see today, it causes no problems for the exodus crossing. The slope of descent is far more important than the depth. The Straits of Tiran, as we see them today pose absolutely no problem for a crossing by a million people since the slope is shallow and the depth is no more than 600 feet. (205 meters). So 3500 years ago the 18 km crossing point at the Straits of Tiran would likely have been deeper than it is now over the coral reef and shallower than it is now in the two shipping channels. In other words, 3500 years ago it may have been a uniform depth for the entire 18 km of between 100-200 meters. A very easy crossing indeed. There is one other natural land bridge that provides the only other possible crossing site in the Gulf of Aqaba that is adjacent to Nuweiba. This is not likely the crossing point, since the depths there reach 765 meters (2300 Ft.) and with much steeper slopes. Neweiba is also in the middle of a mountain range making it difficult to access for the Israelites. It doesn't have easy continuous access back to Goshen like the Straits of Tiran offer. It does too good a job at "shutting them up in the wilderness" since there is a very narrow and long canyon through the mountains they needed to cross to even get to the shore at Neweiba. Neweiba is therefore a distant second choice to the Straits of Tiran for the location of the Red Sea crossing. The incline across the Enterprise Passage on the west side of Gordon Reef is easy even today to cross. Remember miracles were involved here so if it was too steep, perhaps God filled in some dirt ahead of time! The Bible says that pharaoh's army sank to the bottom of the sea like a stone, as well as others washing up on shore. "They went down into the depths like a stone. ... They sank like lead in the mighty waters. " Exodus 15:5, 10 "You hurled into the depths, Like a stone into raging waters." Nehemiah 9:11. As God released the water, the surge would be like a 40 foot tsunami (wave) that would easily sweep the entire army off the 800 meter wide land bridge into 1300 meter deep water immediately on either side. The deepest part is 1800 meters. Pharaoh's army sank to the bottom like a stone in very deep, mighty, raging waters! It was a bad day for heavy body armor. Divers have claimed to find what looks like "18th dynasty Egyptian, eight spoke chariot wheels", 50 miles north of the Strait of Tiran in shallow water. To really do the job right, a professional deep sea archeological expedition of "Titanic proportions" is needed to explore the depths of 1800 meters in much of the 30 mile ocean gully at the bottom of the Gulf of Aqaba. The Titanic is in 4000 meters of water so 1800 meters is clearly possible. Although cold water would preserve the wood, realistically, with earthquakes and natural sedimentation, it is unlikely to find anything that is 3500 years old at the bottom of the deepest parts visible to any dive team, but its worth a try! Once they crossed the Red Sea into the Land of Midian, what is now North Saudi Arabia, they headed for Jebel al-Lawz, which we consider the best candidate for Mt. 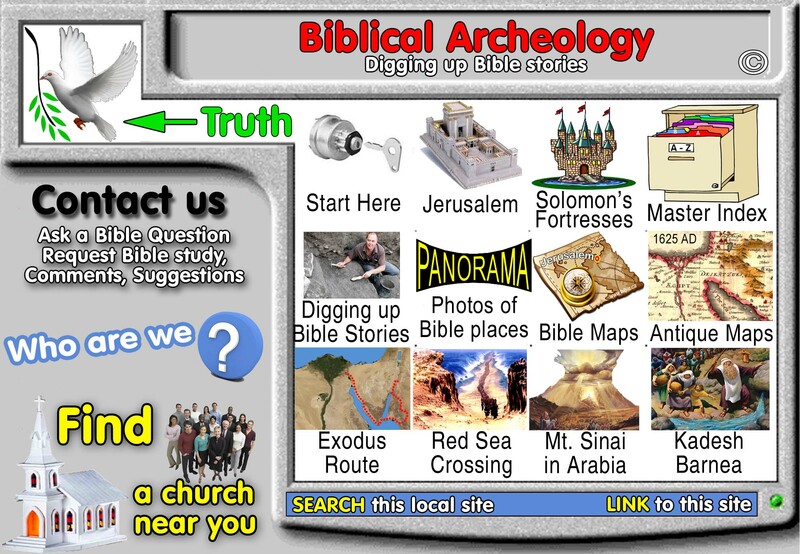 Sinai when both the Bible and Archeology are considered. Mt. Sinai located near the following areas: Wilderness of Etham and wilderness of Sinai are synonymous. Mt. Sinai was in the wilderness of Shur, where the Ishmaelites lived, which was in the land of Midian.